Granting PEF certificates in EnergyU can now be accomplished using new method. Announcing… the online PEF Completion Uploader. This new online feature will allow you to upload a CSV file containing PEF completions for your users. You may have noticed a new PEF User ID field present in the user profile. The PEF User ID must match the Login Name in order for the PEF Uploader to work. For all current users, this field was populated on March 12, 2018. Going forward, administrators will be required to enter this data when adding new users. To populate this field, copy the contents of the Login Name field and paste it in the PEF User ID field; using copy/paste will ensure the two fields are an exact match. In order to use the PEF Completion Uploader, you will first need to request access. Click the Request Login Approval button and complete the form; you will receive email notification when your access has been approved. Once access is provided, simply login using your EnergyU login name and password. Review the PEF Upload Guide instructions if you will be creating the upload file from the EZval logfile. Click the Download CSV Template link in the upper right if you will be creating an upload file from scratch. Click in the box to browse and select your upload file, or drop your upload file in the box, then verify a successful upload at the bottom of the web page. NOTE: Successfully uploaded PEF completions will be noted immediately in the Credits by User report. Certificates may take up to 20 minutes to grant. Completion data older than 30 days is not included in the automatic ISN transfers – contact MEA to request a transfer. If you have any questions on downloading and installing EZval, or using the PEF Uploader, please contact MEA Support. See the number of EnergyU licenses you have set up for renewal. Click on your company name in the hierarchy. Click the System icon (looks like a monitor) at the left. Under the Configuration Settings Category select Level Structure. Click the Edit Level Properties button. 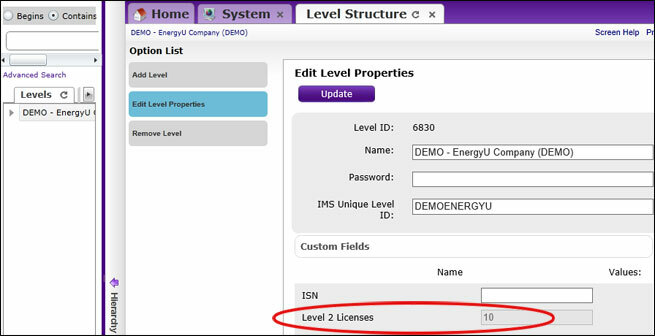 Your number of subscriptions will appear in the Level 2 Licenses field. Note: When adding users, you cannot add more users than your total number of subscriptions. You can contact MEA Technical Support at 651-289-9600 x124 to purchase additional licenses as required. Run a level roster report to view information on the users you have enrolled in the system. This report will include inactive users; inactive users do count toward your subscription usage. Contact MEA Support if you need to change your license count or archive inactive users.